Robert Haines’ and Richard Berthold’s classic game of political intrigue and diplomacy is back in full form! 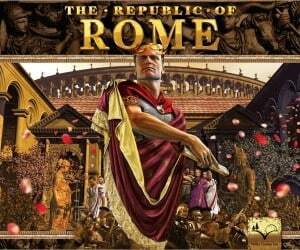 Republic of Rome is a distillation of 250 years of Roman history, from about 265 B.C., all in one evening! In Republic of Rome, players are in a constant balancing act between personal advancement and the welfare of the state. Players build the empire from scratch and thus develop and change the political environment in which they are competing. Players’ Senators vie for political power, military commands and economic advantages against the backdrop of a turbulent world. Deals and counter-offers abound. Short the necessary votes for Consul? Trade the Armaments Concession for a faction’s support. Spartacus has destroyed your villa? Send Pompey off with ten legions to crush him. But is that too much power to entrust to one man? What if Pompey rebels and marches on Rome? The game contains three scenarios which divide the color-coded cards into decks simulating the Early, Middle, and Late Republic. Those wishing a larger game can combine them into a Campaign Game of truly epic proportions. A solitaire and two-player version are also included for those unable to muster more players. This new version contains all new artwork by Kurt Miller, Mark Poole and Patrick Turner and re-written rules by John Rodriguez meant to address and clarify all previous errata. This is a 1 – 6 player game with a playing time of approximately 3 – 5 hours.